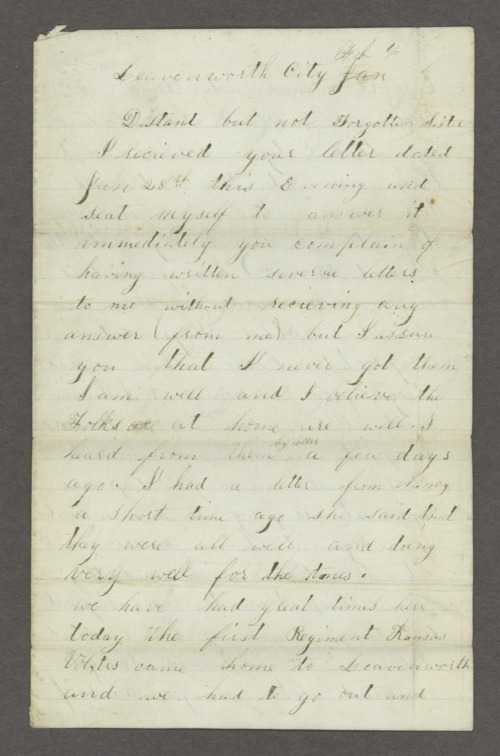 Eighteen letters written by Abishai Stowell to his sister Margaret Stowell Torrence, Gambles, Alleghany County, Pennsylvania. The letters were written while he served in the Civil War. Stowell was a private in the Second Kansas Infantry, Company E, he enlisted May 14, 1861 and was mustered out October 31, 1861; re-enlisted in the Second Kansas Cavalry, Company A, November 6, 1861 and was promoted to corporal April 15, 1862; re-enlisted in the Second Kansas Cavalry, Co. A, January 5, 1864 and promoted to sergeant March 25, 1864; and re-enlisted in the Second Kansas Cavalry veterans of Co. A and was assigned to Co. B, January 5, 1864 and mustered out June 22, 1865 at Ft. Gibson.